To give an idea, a 1GB hard drive, with Windows 95, Microsoft Office, Microsoft Publisher, and some miscellaneous files, takes about 530MB of disk space. 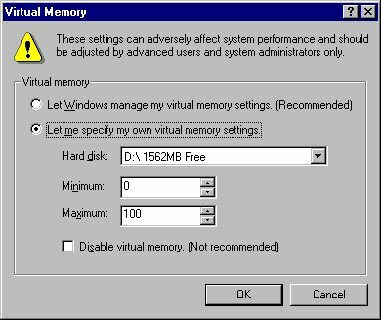 After upgrading to Windows 98, installing FAT32, and running the Maintenance Wizard, we cut the amount of used space down to 480MB. You can monitor your swap file size by using System Monitor. Choose Memory Manager, Swap File Size to monitor the size of your swap file. Win98 has a setting to check for removable floppies which is set to "on" by default. You can uncheck this for a faster bootup if you don’t have any removable floppies. Click Start, Settings, Control Panel and double-click the System icon. Click the Performance tab, and click the File System tab. Under the Floppy Disk tab, uncheck "Search for new floppies every time your computer starts.